It's currently our off season. We will re-open for Easter starting April 8,2019.
a location that fit our needs & was economically wise. Having been unable to find that perfect spot- we are going to have a PICK-UP LOCATION. ** DON'T WORRY WE WILL HAVE ALL YOUR FAVORITES AND WE'LL MAKE IT EASY FOR YOU TO FIND US AND PICK UP EVERYTHING YOU'LL NEED TO MAKE YOUR HOLIDAYS COMPLETE. What does that mean for our faithful customers: We hope that we will be able to have more depth in the products that are everyone's favorites, by eliminating some the more fringe products. After analyzing our business for 22 years we saw that 80% of our business was done with 20% of our products. So we will focus more on those signature items you have come to love from us. 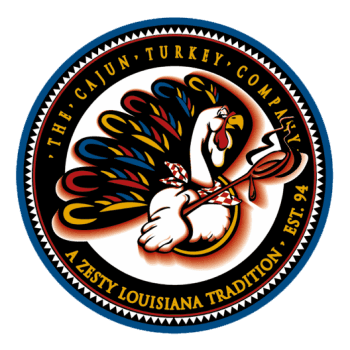 Real Cajun classics like: gumbo's, ettouffe's, cajun side dishes, classic side dishes, desserts and of course our cajun fried turkeys, tur-duc-hens, stuffed chickens, and honey glazed hams. We're celebrating our 22nd year this Holiday Season. I can't believe it's been 22 years since I fried that first turkey in my garage. I thank each and every one of you for shopping with me and I'm looking forward to another 22 years.